Fourth of July means family, fun, fireworks + fancy Pinterest dishes? Whatever happened to hotdogs, pasta salad, + classic American beer!?! Are you tired of your neighbors bringing the best dishes to YOUR cookout? We are here to help with recipes, DIY projects + some of our own Pack Up + Go favorite cookout dishes. We love the classics just as much as the next true American but we also know the high demand for miniature bites and decorative red, white + blue creations. For the best bbq on the block try these festive foods! It is easy to put together a fruit tray in a patriotic fashion to make it look as if you know what you are doing. The best colorful fruits are strawberries, raspberries, watermelon, + blueberries accompanied by white cheese! Our favorite combo is watermelon, blueberries, + Feta cheese. Skewer them together or build a flag display! You can do a lot with colorful fruits that will sure to be a fan favorite treat! For more patriotic dishes, try these fun firecracker hot dogs. Simple yet aesthetically pleasing + boy do they taste good too! They are like crescent dogs with a twist adding more flavor + fun to your dish. Buffalo Chicken Dip is one of the easiest crowd pleaser dips to make! Switch up the dish + create buffalo chicken balls. The dish becomes easily bite sized so your guest don’t have to crowd over the bowl double dipping the chip into your creation. Can’t take the heat? Pair them with blue cheese. The two are a perfect combination to satisfy everyone’s taste buds! Try this recipe from the Real Housewives! Layered cake is the ultimate holiday challenge for any cookout! If you can tackle these towers you will completely win your guests over! Try this layered cake with an american flag crafted into each slice. Should be easy, right? If Betty Crocker can do it, you can too! And if you can’t we’d love to see you try. Send us your attempts at press@packupgo.com! Red, White, + Blue cocktails sound like a hangover but look amazing! Get your cookout trending on Instagram with one of these delectable drinks on BuzzFeed. Our favorite is the multi layer cocktail that adds the perfect mix of flavor. Mix that Drink even shows you a tutorial on how to layer the cocktail! Drink your pride with one of these fancy concoctions. "My mom always made deviled eggs and I’d eat them until I was stuffed full!" A simple snack with a mix of color can make for a festive feast! Here is a fun DIY that teaches you how to color your own eggs. "I am all about the chips + dips. Bring on the guacamole!" Want to try a new spin on the classic guac recipe? Try adding goat cheese + strawberries to give this favorite snack a makeover! "It is not the 4th of July without watermelon!" While we agree watermelon is quintessential for all 4th of July celebrations, no one ever said it have to be plain! 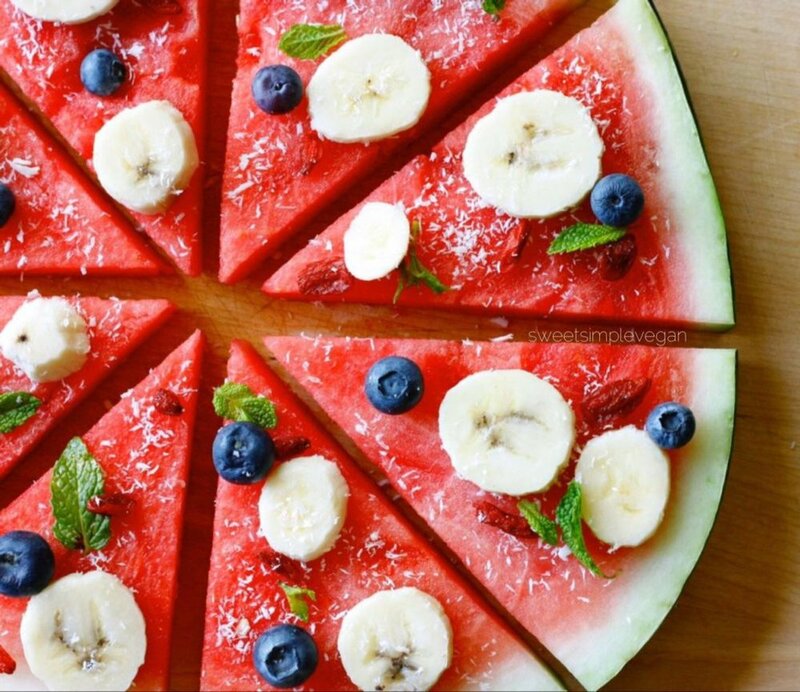 if you are feeling adventurous you can branch out and make a healthy, vegan watermelon "pie"! Just swap hot sauce for BBQ sauce for a sweet savory dip. Try this Kraft Recipe! "A staple of the Midwest + Summer gatherings is strawberry pretzel salad!" Strawberries + pretzels + cool whip = what gets better than that? Haven't tried this interesting treat? We dare you to put this recipe to the test! "I love a good grilled corn on the cob!" We all love a good Mexican street corn recipe topped with chili powder, Cotija cheese, + cilantro. If you want even more amazing corn recipes check out these recommendations! Did we miss any of your Independence day favorites? Let us know in the comments!